In last week’s episode, I broke down the numbers for my ecommerce store at BumblebeeLinens.com. So in this episode I’m going to talk about my other 7 figure online business, MyWifeQuitHerJob.com. What I like about running MyWifeQuitHerJob.com is that it’s a very hands off type of business if I need it to be, which comes in really handy when you get injured and don’t want to do anything for months in the latter half of the year. All told, I spend between 15-20 hours per week on this business and it generates over 7 figures in profit. Listen to this episode to see how 2017 went! You’re listening to the My Wife Quit Her Job Podcast, the place where I bring on successful bootstrapped business owners, and delve deeply into what strategies are working and what strategies are not with their businesses. 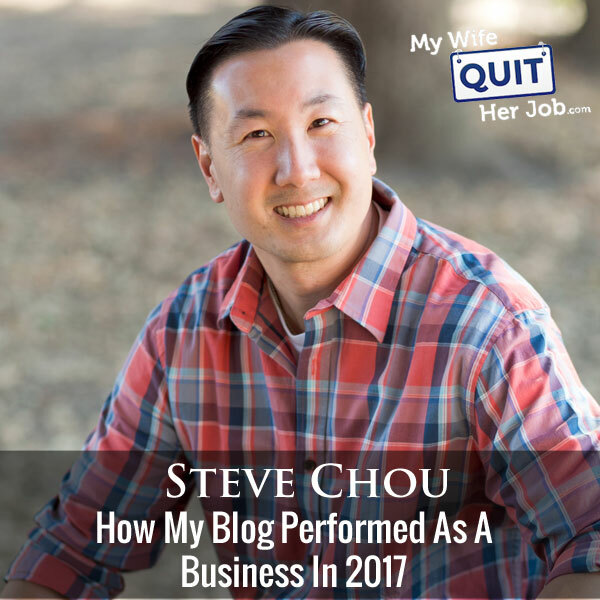 Now today is part three of a three part series where I break down how all of my online businesses performed in 2017. So last week I covered my e-commerce store BumblebeeLenin.com. So this week I’m going to talk about mywifequitherjob.com. But before we begin I want to give a quick shout out to Privy who is a sponsor of the show. Privy is the tool that I use to build my email list for both my blog and my online store. And basically they are an email list growth platform, and they manage all of my email capture forms. And I use Privy hand in hand with my email marketing provider. There’s a bunch of companies out there that will manage your email capture forms, but I like Privy because they specialize in e-commerce. Right now I’m using Privy to display a cool wheel of fortune pop up. Basically a user gives their email for a chance to win valuable prizes in our store. And customers love the gamification aspect of this, and when I implemented this form email sign ups increased by 131%. So bottom line, Privy allows me to turn visitors into email subscribers, which I then feed to my email provider to close the sale. So head on over to Privy.com/Steve, and try it for free. And if you decide that you need some of the more advanced features, use coupon code MWQHJ For 15% off. Once again that’s P-R-I-V-Y.com/Steve. I also want to give a quick shout out to Klaviyo who is also a sponsor of the show. Always blessed to have Klaviyo as a sponsor because they are the email marketing platform that I personally use for my ecommerce store, and I depend on them for over 20% of my revenues. Now, Klaviyo is the only email platform out there that is specifically built for ecommerce stores, and here is why it is so powerful. They can track every single customer who has shopped in your store and exactly what they bought. So let’s say I want to send an email to everyone who purchased a red handkerchief in the last week, easy. Let’s say I want to set up a special auto-responder sequence to my customers depending on what they purchased, piece of cake, and there is full revenue tracking on every single email. Steve: Welcome to the My Wife Quit her Job Podcast. In last week’s episode, I broke down the numbers for my e-commerce store at BumblebeeLinens.com. So in this episode I’m going to talk about my other seven figure online business, mywifequitherjob.com. Now truth be told, I didn’t actually change that much in 2017 from 2016 except for one major thing, which I’ll talk about in a little bit. But for the most part what I like about running mywifequitherjob.com is that it’s a very hands off type of business if I needed to be, which comes in really handy when you get injured and you don’t want to do anything for months in the latter half of the year. But all told, I spend between 15 to 20 hours per week on this business, and it actually generates over seven figures in profit. I have one assistant who helps me out with the podcast, but outside of that my mywifequitherjob.com is mostly a solo affair. Now, what’s nice about running the blog and the podcast is it allows me to meet other entrepreneurs and give back to the community by helping others start their own businesses. Now I’m often asked what type of business to start if you have no money and no ideas. And my answer to that question is always to just start documenting something that you’re good at. Put everything down on a blog or a podcast, or a video, and you’ll eventually build a following and then good things will happen. And then once you do have a following, you can easily make money. Now might be hard to understand how it works until it happens, but just trust me. What’s funny is that my mom still has no idea how I make money on the blog, but she has slowly started to accept the fact that I’ve ended my engineering career of 20 years to pursue this full time. Now another common question I get asked is what I would start today if I had to start all over again, a blog or an e-commerce store. And the answer depends. If you want to earn revenue quickly then go ahead and start an e-commerce store. But if you have a three to five year time horizon and you don’t need to be making money right away, then start a blog. Whereas an e-commerce store will make you money sooner rather than later, it actually doesn’t scale nearly as well as a blog does because you have to deal with physical products. But a blog will take a long time to develop and quite frankly blogging is a slog. And in fact mywifequitherjob.com didn’t make any money for three years. And if you don’t make money for that long of a time, it’s actually a major test of your persistence and your determination. And to put things in perspective, I’ve been doing this for nine years now, nine years. I mean that’s a long time. None of this stuff happened overnight, and the only reason that I’ve been successful is because I made it a part of my lifestyle and routine. All right, in any case let’s jump to the numbers. In 2016, I had a major milestone in breaking seven figures in revenue. But in 2017, I actually managed to make seven figures in profit on revenues of about 1.35 million. Now just going forward, I just want to give you guys a heads up. I’m going to stop giving absolute revenue numbers for mywifequitherjob.com because the numbers don’t really add any value to the conversation. Instead I’m going to speak in relative terms from here on out and instead teach you exactly what I did to achieve those numbers. But I will let you know if I ever reach eight figures which would be an amazing feat. All right first off, traffic increased by 19%. Now email subscribers which is the way I kind of measure my business actually remained relatively flat, and I’ll explain to you why that happened in a little bit. In terms of my podcast listenership, it actually nearly doubled in 2017 after remaining mostly flat in previous years. Now you should take this number with a grain of salt because Lipson my podcast provider recently changed the way they measure stats, and I’m kind of still waiting for the dust to settle. But those are the main metrics that actually matter when it comes to blogging for my mywifequitherjob.com. All right, so let’s talk a little bit about the lowlights and the highlights for the year. The number one lowlight for the year was I ran into major e-mail spam problems early in 2017. There is this group of malicious bots who are randomly spamming my email forms with hundreds of fake subs per day. And even though I switched over to double opt in at the time, these bots are actually really clever, and they actually ended up clicking on the double opt in links in the email. And in fact these bots not only did they click on the double opt in link, but they actually click on every single link in every email that I send to make it seem like a real human. Now the way most people deal with this is that they prune their list by removing inactive subscribers, but because these bots actually click on the links in the e-mails that I’m sending, they’re technically fake active users and it’s really hard to see whether they’re fake or real people. And of course this put me in a major dilemma because a good percentage of these users are worthless, and I couldn’t really distinguish them from real humans. And meanwhile having all these fake subs, my deliverability was going down, and I was paying for subs that would never ever end up generating me money. Now unfortunately my previous email provider ConvertKit did not have a good way to detect these fake subs. So this actually tipped my hand and I was forced to look for another provider. Just a quick note here, I was actually very happy with ConvertKit, and if this spam bot issue didn’t require an immediate solution, I probably would have stayed with them. But I did end up moving to Drip mainly because of one feature that they have that the rest don’t called the lead score. Basically the way it works, you can track how engaged a subscriber is by assigning a point value to them. If they click on a link or open an email, their score goes up, but if they never open the score goes down. As a result, based on this one number you can get an idea of how engaged a subscriber is. But what’s key here and how I use this to solve my spam problem is that you can actually perform these crazy automations to quickly eliminate subscribers that follow certain patterns. So the combination of those two things managed to eliminate my email spam I would say by at least 90%. Anyway once I moved over to Drip, I did a mass pruning of fake and inactive subs which actually caused my email subscriber count to remain mostly flat from the previous year. Now the second lowlight which happened towards the middle of 2017 was that my Facebook account, my ads account got banned for about three weeks. I didn’t get any warning whatsoever. I just woke up one morning and all of a sudden I noticed that none of my ads were running, and then I got this email saying that I had violated some Facebook ad policy and I was banned. Now thankfully, Facebook actually isn’t a huge part of my business, but it does drive new subscribers and it actually allows me to reach millions of new potential customers. I run ads to my blog post, to my courses, to my conference and actually rely heavily on retargeting as well. Now thankfully, I got reinstated relatively quickly, but it did remind me once again of the importance of diversifying my traffic sources. And by the way you’ve probably heard this from me time and time again, if you are depending on a single source for your revenues like Amazon, eBay, whatever it is, you really need to diversify or try to own more of your customers. If Facebook ads for example was my entire lead gen strategy, I would have been tossed. Anyways that’s pretty much it for the lowlights; let’s talk about the good things now. All right first thing in 2017 I spoke at four conferences, Social Media Marketing World, Digital CoLab, FinCon and of course my own conference Sellers Summit of which I keynoted for the second straight year which is pretty sweet. No one there to dispute me there except for my partner. But I will be speaking at these four conferences again, so if you ever want to meet up, you know where to find me. And as I look back on last year, I think four conferences per year to speak at is pretty much my limit. It takes a lot of time to prep a speech, and I don’t really like the travelling aspect because I have to be away from my family. But once again I’m going to be at these conferences. Social Media Marketing World actually incidentally is next month, and it’s going to be in San Diego which is a great place to have a conference. And so if you’re going to be there, send me an e-mail, look me up and maybe I’ll do some sort of meet up there. In other news, I also raised the price of my e-commerce course up to 1497, and I’m happy to say that it’s still selling well. I remember back in the day when I was terrified when I launched at just $299 for a lifetime membership. But I will say this, the great thing about raising the price of my class is that it weeds out the tire kickers, and I can actually focus my efforts on the students that I have. And if you haven’t determined this from my personality, I never like to play the volume game. I prefer to work in small, intimate, and motivated groups, which is incidentally one of the main reasons why I purposely kept my e-commerce conference the Sellers Summit very small. I’d much rather build deeper relationships with fewer people than have a whole bunch of friends on a surface level. Anyway in case you’re curious, here’s how mywifequitherjob.com makes money. The first way I make money is through podcast sponsorships. Podcast sponsors only generate a very token amount of money, but it does manage to pay all the bills for the podcast and my editor, and that’s mainly the reason why I run these ads. The primary reason I run my podcast is actually to meet new people. As I mentioned before, I work from home, it’s kind of lonely here at times, and by talking to someone on Skype for an hour or more, you actually instantly build a connection. And over the years, the guests that I’ve had on my podcasts have become my friends and even speakers at my conference. I just want to take a moment to tell you about a free resource that I offer on my website that you may not be aware of. If you are interested in starting your own online store, I put together a comprehensive six-day mini course on how to get started in e-commerce that you should all check out. It contains both video and text based tutorials that go over the entire process of finding products to sell all the way to getting your first sales online. The second way I make money is through affiliate revenue. Now since I run my own online store, I use a lot of different tools and in fact I like to think of my shop like my own personal laboratory that kind of works hand in hand with the blog. Mywifequitherjob.com allows me to easily get into contact with software companies. I can try out their tools and get real sales numbers, and then report the results on my blog. I will never promote a tool or a company that either I, or one of my close colleagues haven’t used in real life. And as a result of this, people tend to listen to my recommendations. The next way I monetize my blog is through my online course. Now as of right now, I have almost 3,000 students in my class. And I’m actually proud to say that 59% of my students who have been with me for a year are making at least four figures for month, and 9% are doing at least $50,000 per month. And in fact one of my students Abby, she actually now runs a multimillion dollar business, and she just published a book on her journey. Now it’s stories like this that make me really happy to teach my class, and it’s actually extremely rewarding for me to see others succeed. Now my final revenue source is my annual conference, the Sellers Summit. Now incidentally tickets are on sale right now, but they are almost sold out. All the mastermind passes are gone right now, but we do have some regular passes left. And as I mentioned earlier, I like to keep things small and intimate with a focus on learning and networking. So if you want to meet up, and you want to learn how to sell physical products online and you want to meet the community, then head over to sellerssummit.com. Now while we’re on the topic of conferences, I just want to note that the Sellers Summit is actually not really a big moneymaker for me. Now if you’ve ever run a conference before, there are a ton of fixed costs involved like food, rental space, beverages, that are super expensive because the hotel jacks up the prices on everything. Not only that, but just organizing the event like this ends up being a logistical nightmare. Now the reason I run my event is so I can meet all of you in person, because if you look at it in terms of dollars per hour of time it’s simply not worth it, but the human connection is priceless. All right the final thing I want to talk about is what I’ve been doing to improve my blog. Now towards the end of 2017, I did a major content audit. And the reason why I did this is because the SEO game has changed a lot over the years. Back in the day it was all about writing separate blog posts to target long tail keywords. Well guess what, Google now is smart enough to know about the long tail, and there’s now an increased focus on improving your on site metrics, how long is a person staying on the page, are they engaged with your content, do they click on your links in the search results or do they bounce right away? As a result short articles just don’t cut it anymore, which is probably why you’ve noticed longer and more comprehensive posts on mywifequitherjob.com. Now before the content audit, I had close to 900 posts, and some of these were like 300 word posts of no value. I was doing roundups, I was doing these like status updates. I member one article I published where I got up and said, uh it’s such a busy day today, but I’m going to go in on the weekend to start shipping some products, stupid things like that which have no value I just simply eliminated all together. Back in the day, and if you guys have been following me for a long time, I had guest bloggers, I even had a paid writer that wrote these short posts that never went anywhere. And as a result, I removed all of them. Back in the day it was about quantity over quality, but now in general for SEO, it’s now better to have a nice tight site full of great articles instead of a ton of mediocre content. And in fact I like to use my buddy Noah Kagan’s analogy, your site is like a restaurant. On your menu do you want to include everything that you know how to cook, or would you rather only list your best dishes for sale, because when people come to your site they tend to judge you by the first piece of content that they see. And when you have large quantities of crappy content let’s say that one person ends up finding you through this piece of crappy content. Well guess what, they’re probably not going to come back again. Whereas if they see something really amazing, and they tell their friends about it, they’ll end up coming back again, you can leave a good first impression and hopefully they’ll tell their friends or come back for more, or subscribe to the email list. Anyways over time I’m going to make it a priority to make every single post on mywifequitherjob.com awesome. And as a result, right now and this is like a really long process, I’m actually painfully going through old posts and deciding whether to delete or rewrite them, and this is just going to take a very long time. I don’t know if you guys have been noticing lately, but on the blog there have been some older topics that I’ve completely rewritten and added a lot more value too. And quite frankly some of the older content had become obsolete, and I’m in the process of updating all that. Now what’s sad about all this is that I actually had to remove a bunch of my earliest posts when I first got started in 2009. Back then my writing was horrible. I’m actually pretty shocked at how far I’ve come with my writing, and this is coming from someone who used to hate writing altogether, and who was extremely slow at it. Back in the day for me to write like a 500 word post would take me hours. I’ve gotten a lot faster over the years, which just shows that practice makes perfect. In other news I also hired a new Pinterest person who will be trying to reestablish my Pinterest presence after a small debacle at the beginning of 2017. As I mentioned in a previous podcast, Pinterest ended up changing their algorithms which started to change the way I started doing things. Anyways that is pretty much it for mywifequitherjob.com in 2017. I’m probably going to be doing more solo podcast episodes this year mainly because I’ve gotten a lot of emails from people who’ve been requesting it. I’m still going to do these interviews from really cool entrepreneurs, but also perhaps be throwing in some impromptu videos here and there. In general, I actually like doing videos, but there’s just so much prep time and setting up lights and all that stuff that in the end I’m just too lazy to do it. But hopefully I’ll just get on and just do some impromptu videos that require no prep, and I’ll try to do more of those in the coming year. But for the most part, I’m going to be focusing on my class and pumping out the best e-commerce content out there based on experience. Here’s to a great 2018. I hope you enjoyed that episode. It was another record year for mywifequitherjob.com, and I only foresee it getting better as my audience grows from year to year. For more information about this episode, go to mywifequitherjob.com/episode192. Once again I want to thank Klaviyo.com for sponsoring this episode. Klaviyo is my email marketing platform of choice for ecommerce merchants, and you can easily put together automated flows like an abandoned cart sequence, a post purchase flow, a win back campaign, basically all these sequences that will make you money on auto pilot. So head on over to mywifequitherjob.com/K-L-A-V-I-Y-O, once again that’s mywifequitherjob.com/K-L-A-V-I-Y-O. Now I also want to thank Privy.com for sponsoring this episode. Privy is the email provider that I personally use to turn visitors into email subscribers. They offer email capture, exit intent, and site targeting tools to make it super simple as well. And I like Privy because it’s so powerful and you can basically trigger custom pop ups for any primer that is closely tied to your e-commerce store. So if you want to give it a try, it is free. So head on over to Privy.com/Steve, once again that’s P-R-I-V-Y.com/Steve.